Both courses are unfortunately sold out. Update 2019-04-12: Agenda for Annual Meeting in Oslo 16th of May 2019 is now available here. Welcome! Second edition of the swedish textbook is now available! Click to download chapter #7, Radiologi. Check your favorite online bookstore for available editions. The aim of this website is to promote and develop trauma radiology work in the Nordic countries. Since 2000 we have arranged biannual Nordic courses in Trauma Radiology with a faculty incorporating US, European and Nordic radiologists well experienced in trauma work. The courses gained a lot attention with more than 700 participants all together. This and other trauma radiological work has been partly presented at this website. The field of trauma and emergency radiology is established since 15 years in the United States and focus on trauma is increasing in the Nordic countries. 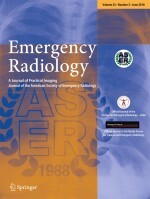 In a time of subspecialization, we also feel the need to focus on the subject of emergency radiology. We have thus together decided to establish an association for both trauma and emergency radiology with participation from the Nordic countries, Nordic Forum for Trauma and Emergency Radiology, (NORDTER). The association is open to membership for physicians regardless of speciality, researchers and all others interested in trauma and emergency radiology. The aim will be to open a broad forum to exchange knowledge and ideas, to generate educating discussions, and to seek cooperation with other Nordic and international organizations. If you are interested to contribute to or join the Forum, please contact: nordictraumarad@gmail.com for further information. The website is the belongs to Nordic Forum for Trauma and Emergency Radiology.